Formality requires a group of “experts” on the “proper way of doing things”. In the church today we have many experts on formality, but very little anointing. 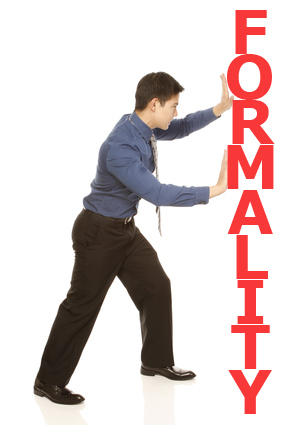 Formality does not promote, spontaneity, questions or discussions of any kind. Even their “fellowship” becomes filled with formalities. One of the greatest challenges the church is facing today is indeed “formality.” The Pentecostals have their formalities, the Baptists have theirs, the Presbyterians, the Catholics, the Charismatic Black Church, the Latinos, etc. Formality is everywhere; but we should not pursue formalities; we should be organic in our relationship with God and in our relationship with one another. For something to be organic it must derived from living organism. Have you noticed that organic foods are usually smaller? However, they are richer in substance and in taste. A formal church is usually boring and the focus becomes the order of service. An organic church is alive because it embraces a lifestyle of listening to God. When you bring a small group of people and they spontaneously engage in conversations there is no pressure; it may start a little awkward, but if you have a group of true believers; they will always bring up the love of their lives…Jesus Christ! However, as soon as we make it look formal people gets nervous. It becomes a public speaking event. Jesus did it all; He spoke to large groups, in the Synagogues, to the disciples only and to individuals. But everything was organic and not formal. We never read that Jesus was the guess speaker; He just spoke. Is amazing to me that the Bible makes reference to listening to our conversations, yet no reference to God listening to our Bible Studies and sermons! Have you ever been in Bible Studies where you have a few that seem to love to listen to themselves and share their great revelations, but when you catch them, “just talking” outside of Bible studies, Jesus is the last topic they chose to talk about it? It is easy to put a Bible Study together; it is easier to just sit there and punch the clock, but if you want to see somebody’s heart, just listen to his or her conversation; that’s the real deal (Matthew 12:34). As my wife and I open our home for Bible Studies and fellowship, the challenge becomes to bring down traditions of man and enter into a place where we as God’s people can be free. Posted on 06/03/2015 06/03/2015 by angelcasianoPosted in Christian LivingTagged God, Holy Ghost Man-made religion, Jesus, religión, the church.